A clutch of post-war buildings in Coventry have been heritage listed, as the city prepares to become UK City of Culture for 2021. Eight architectural sites have been selected from the pedestrianised Upper Precinct shopping area, built as part of the UK city's regeneration following heavy bombing during the second world war. They include buildings occupied by the retailers Marks and Spencer, Woolworths and British Home Stores (BHS), as well as a dance hall, a hotel, a shopping centre, a decorative mast and a foundation stone for the redevelopment. The government has given a Grade-II listing to all eight sites on the recommendation of Historic England, the public body responsible for protecting Britain's historic landmarks. They are among a relatively small number of postwar retail buildings on the list. "The reinvention of Coventry after the second world war and the vital role that its postwar architecture played in restoring pride and confidence was renowned internationally," said Historic England chief executive Duncan Wilson. "The buildings, built between 1948 and 1958, form the centrepiece of Coventry's post-war reconstruction and reflect the spirit of a re-born city," he continued. "They deserve the recognition and protection that listing brings." Campaign group the Twentieth Century Society welcomed the decision as an important step in recognising the importance of Britain's post-war architecture. 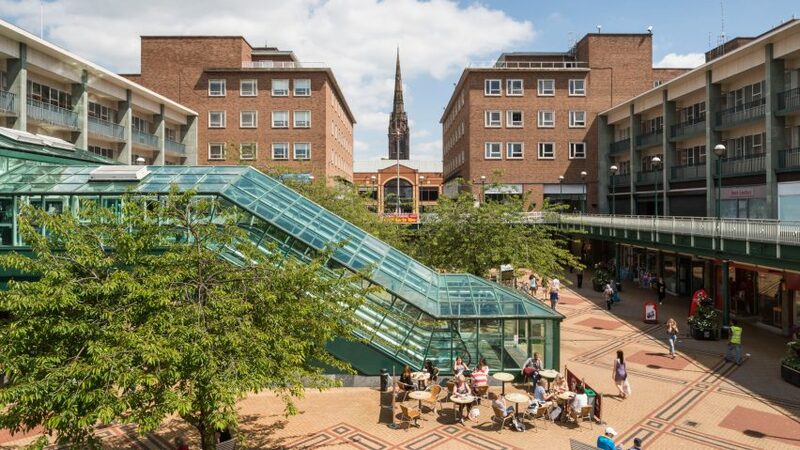 "Coventry was one of the most comprehensively re-planned cities in the country following extensive bombing in 1940," said a statement released in support of the listing by The Twentieth Century Society. "The Upper Precinct is of major importance as a group of buildings which set the standard for town planning practice in the post-war era, and for their overall architectural quality." Critics have spoken out against the dearth of buildings from the era included on the preservation list, for instance, Dezeen columnist Owen Hatherley recently called for better protection for the pedestrian precinct. "We certainly recognise the importance of post-war heritage across England – this is reflected in our current listing priorities," a spokesperson for Historic England told Dezeen. Alongside architecture from the postwar period, the organisation's listing priorities include examples of postmodernism, mosques and quaker meeting houses. The new listed status of the Coventry buildings means an already approved multi-million pound overhaul of the Upper Precint by developers Shearer Property Group will now need to achieve Listed Building Consent for any alteration of the buildings. Current plans involve removing later additions to the buildings, including escalators added in the 1990s. They also include infilling colonnades, the removal of canopies, and the addition of 50 new shops and a multi-storey car park. "The society has been raising awareness about the level of redevelopment planned in the run up to 2021 – the year that Coventry will be celebrating its status as City of Culture – and have been concerned that many of the best buildings will be compromised or lost before they can be duly celebrated," said a statement from The Twentieth Century Society. "These listing decisions have come just in time." The list now includes the North and South Link Blocks and Piazza in the Upper Precinct, which were built between 1954-1956 featuring elevated walkways and bridges that created a car-free zone for shoppers. The now-listed former Hotel Leofric in Broadgate, which formed part of architect Donald Gibson's post-war regeneration of the city, is described by Historic England as having "thoughtful, considered design". The former Woolworths building and a row of shops, designed by the retailer's in-house architect Harold Winbourne, completed in 1954 and closed in 2009. It has since been divided into units for Boots chemist and Poundland. The Locarno Dancehall, which now hosts the city's Central Library, features colourful mosaic murals by the artist Fred Millett and a dance floor converted into a reading room. The building that formerly housed BHS retains its canopies with built-in sun awnings, and the Marks and Spencer building designed by Norman Jones Sons & Rigby features decorative slate and travertine panels. Also listed is the Broadgate Standard, or Elephant Mast, and the Levelling Stone that was laid on 8 June 1946 "as a symbol of the city's rebirth and regeneration".